"Quiet and lovely and thought provoking." Yes, that's how I felt about The History of Love, which I loved at the time but honestly don't remember much about now. I don't know if you read a physical book or an ebook, but I read the physical book because it was the dark ages when I read it, and the different story lines have a different decorative element at the beginning of each chapter. Subtle, but it was a good way to make me pay attention at the start of each new chapter. Yes, I read it in paperback and I did appreciate the differences. I love when publishing houses and authors pay attention to the book as an object too. I always enjoy Krauss while I'm reading her, but her books are not the ones I am thinking about a week or a month later. Oh no! Another reader that didn't enjoy it necessarily. I feel like I'm in the minority in loving this title. I think I can confidently say it's my favorite novel. However, I'll admit the story isn't what captivated me, it was the prose and the emotion it evoked. She managed to make me laugh and cry and relate to those everday moments that I feel but can't quite articulate. Alas, no two readers will always agree! Wish you had enjoyed it more, but understand the frustrations! 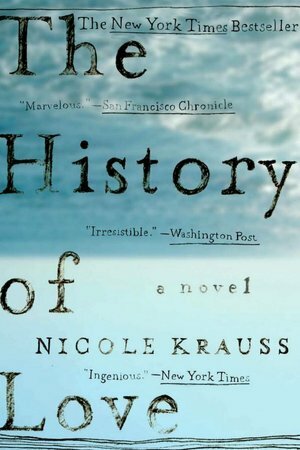 I really loved the characters and I agree that Krauss is a very talented writer. Something about the way she weaves a story from all of these disparate threads just doesn't work for me. Have you read her debut novel? I attempted it but never had the time to finish. I also received an ARC of Great House and COULD NOT finish it. It was so slow that I never wanted to go back and pick it up. I was very disappointed! Isn't it interesting how we can have such different experiences with books by the same author? I'm sorry you were so underwhelmed by her other books. I have certainly heard of this title and author, but never read any of hers yet. I appreciate when an author includes a main character of an elderly man and fleshes it out to be more than a caricature. We have elderly women sometimes take center stage, but it seems the men are short-changed. Let's face it, we live in a youth-oriented society, and in the book world we not only have young adults reading YA, we have many (most?) of the adult women reading it too. Thanks for sharing this. Nice review, Lindsey. The storytelling technique (through different kinds of narration, different time periods) looks quite interesting. It is interesting that the book is wonderful to read but doesn't stay in our mind after a few days. I want to try reading one of Krauss' novels sometime. Thanks for this beautiful review. Nicole Krauss has a very distinct style. I hope you enjoy it when you get to read her books!